The 1 kg Fiji coin bar has a solid feel that evokes the romance and glamour of past centuries yet it retains the elegant design features of a coin. These highly collectible bars are an excellent choice for investors who want to find a safe home for capital. 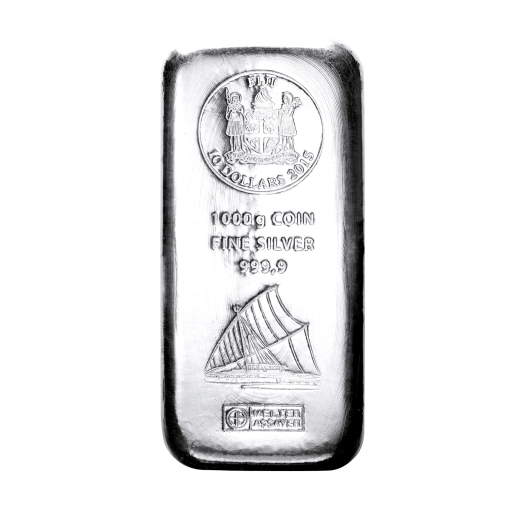 Buy the Fiji 1 kg bar vat free at CoinInvest.com as an attractive and interesting addition to your collection or as a gift for someone special. Silver has long been considered one of the best options for investors and the Fiji bar from the renowned Argor-Heraeus Mint in Switzerland contains one full kilo or 1000 g with a purity of 999.9. It is supplied in sealed packaging with a certificate of authentication issued and signed by the Mint. This striking cast bar was first issued in 2015 and it is legal tender with a face value of 10 Fiji Dollars. It features the weight, purity and value below the crest of Fiji and above a representation of a clipper ship. We continually aim to bring our clients exciting products for collection or investment purposes like the Fiji 1 kilo silver coin bar. We ship all orders quickly and securely so that you are able to enjoy your beautiful 1-kilo coin bar at the earliest opportunity.